Now that is making me want to make sausage and peppers tonight. Sometimes I throw in some cut up potatoes instead of making a grinder with the sausage and it makes for an excellent meal! I think I will be making this dish very soon. Thanks for reminding me of this one leethebard! Years ago my dad had a weekend job where they sold Italian sausage sandwich with What he called a sauce on top.Fried potatoes, some diced pepper and fried with good vinegar in the potatoes. People lined up for it. Got so good he sometimes sold just sauce sandwiches with the potato -vinegar sauce!! Well, sometimes the "food" is just the vehicle for a great sauce after all...LOL. That does sound pretty good. Sort of an agra-dolce - sweet peppers and the sour from the vinegar. Yummmm! Mostly home fries, some pepper, but the vinegar does it It. Became a home fry potato sandwich...not really a mushy sauce. My dad and Uncle who ran the place just called it "sauce". We still make that version of the Italian sausage sandwich often. Delicious! Road trip to New Hampshire today! We mostly just poked around and looked at stuff, but then we went to the Smuttynose Brewery for tasting and dinner. Beers we tried: Wake and Break, Shoals Pale Ale, Old Brown Dog, Summer IPA, Blueberry Short Weisse, Baltic Porter, Farmhouse Ale, and a few I can't remember that were only available on-site. For dinner, we started with pimiento cheese and house-made crackers, split a platter of 5 smoked meats (brisket, ribs, pulled pork, chicken, and hot links) with collard greens, cornbread, and onion rings on the side for our main meal, and then also split the smoked corn ice cream for dessert. 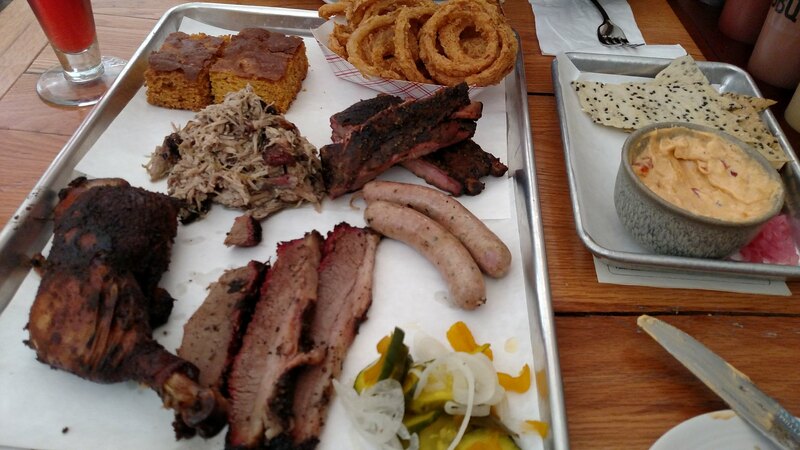 They offer four sauces for the meats, only one of which we enjoyed (the sweet & hot BBQ). Their mustard was like honey mustard with horseradish in it, the Carolina vinegar was like nothing either of us had ever tasted, and they also offered this truly bizarre blueberry something-or-other that was simply not good. The chicken was fantastic, as was the pulled pork. The brisket was New Hampshire good, but any further south it would've been mediocre; ditto the ribs. The "hot links" were meh. Onion rings and collard greens were excellent! The Guy loved the cornbread; I did not (it was more flour than cornmeal, chewy instead of crumbly). The ice cream was odd, yet tasty. It came on a slice of grilled lemon poundcake, with apple jam on the side. Third time's the charm, right? We wanted to go to a place that had excellent ratings on Yelp, but it turns out it's really just the kitchen where they make everything for their food truck. So then we were going to go to another place that also had great reviews, but it was so busy we couldn't park with a half-mile of it. Third choice was the Clambake Restaurant, and we should've just gone there in the first place. The Guy got their backed haddock, which ended up being two gigantic, thick fillets,. Coleslaw and potato salad on the side, easily a half-pound of potato salad. I got their baked scallops, shrimp, and lobster with coleslaw and mashed potatoes on the side. The scallops practically melted in my mouth, the shrimp was done to perfection, and the lobster was tender and juicy. The potatoes were redskin (with skins), and I think they make them with sour cream or perhaps buttermilk. Coleslaw was pretty standard, as were the dinner rolls, but the rolls were an excellent vehicle for soaking up the butter and seafood drippings on our plates. Worked a little late tonight, but one of my Polish coworkers ended up with an extra lunch today, because he'd forgotten that he'd left some food for himself in the office fridge. I accepted graciously. 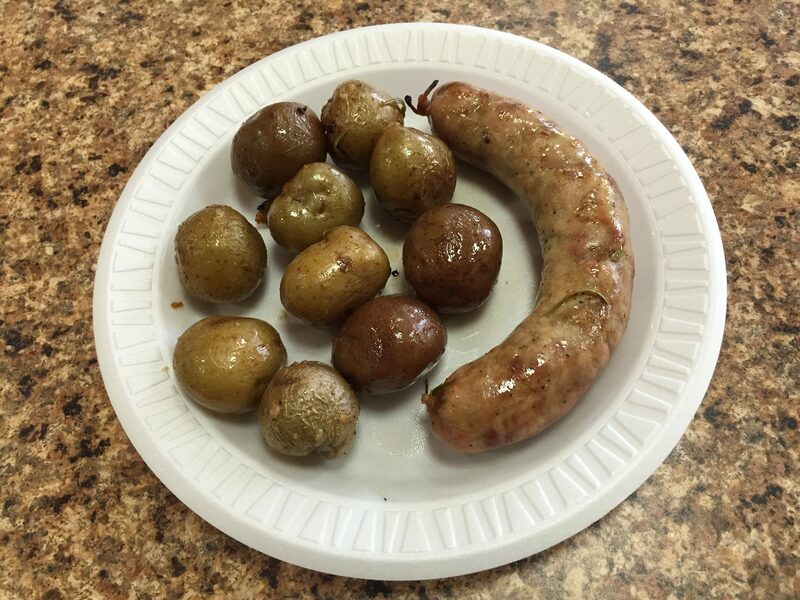 Kielbasa that his dad made, and potatoes from his dad's garden. Tonight - pumpkin soup with a Thai twist, using coconut milk and a little Thai green curry paste. Grilled cheese and salami sandwiches on the side for Chris. Tonight we had potato latkes and cheese blintzes. Each was a first for lleechef, and she liked them. I've been home since Saturday night, but we've mostly been eating whatever I found in the freezer until I got to the farmer's market and grocery store yesterday. Tonight I tossed some chicken thighs, baby purple potatoes, candy onion, and garlic scapes with olive oil and peppered rosemary seasoning and roasted them, then added a bag salad on the side. Had Chicken Pot Pies made at Zooks in Ronk, Pa by the Amish. Went there Monday for a day trip. My wife and I love their pies. Quite famous in the Lancaster Amish area. It's a must stop when we go. Off the beaten trail on a small country road, but it's a must stop everytime we visit this beautiful,peaceful area! I love Them. Applesauce with the latkes and sour cream on both. Dinner tonight was sushi with the family. Not shown in the picture was another plate with unagi and tamago. I also had a bowl of miso soup (quite good) and an appetiser sized portion of shrimp tempura. The shrimp were nice and tender and tasty. We followed up our dinner with a stop at Graeter's and everyone grabbed a pint of their favourites. I was very happy to see that their seasonal peach is back and made a beeline for one. It is so good! OK, now I definitely need sushi! I'll have to see how to work that into my budget next week. Tonight I went simple and seared a ham steak to split, made some un-potato salad (cauliflower), and added cottage cheese on the side. Chicken Tikka Masala and Lemon rice...compliments of Costco!! Slow cooker coriander curried prawns, with basil instead of coriander (cilantro). Coconut milk, green Thai curry paste, Thai aromatics slow cooked on high for 2.5 hrs. Add sliced frozen green beans and peas. 15 mins later, add prawns. Cook for 30 mins, and serve with jasmine or long grain rice. lleechef isn't a fan of applesauce so I skipped it. But she says she's willing to try it next time. YAY! Forget that sugar and fruit garbage...these are the pies for me!! Mrs. C won't be home until around 7:30 so I have the charcoal catching fire for some indirectly grilled chicken thighs, half with Gates' barbecue sauce and half without. We have 5 smashed red potatoes left over from vacation and they'll go on the grill as well. I was tired and lazy and had both un-potato salad and broccoli salad in the fridge, so I called them dinner. Hot dogs with mac and cheese on the side. We too took the easy way out tonight!! Made a pot of chili for the family. Now it's all gone and everyone's satisfied. Made lasagna on Sunday so having that tonight since we had a lot leftover (I made two and froze one to bake off later since I only make this a few times a year) I made my own lasagna sheets from scratch but for the first time ever I made my own ricotta cheese. I will never buy it again. So easy and delicious. Who knew some lemon juice and milk could make magic? I also make it without ricotta sometimes and with the traditional besciamella (bechamel) sauce instead but I felt like the good old cheesy American version this time. I guess I am too new to post photos and/or links yet. System would not let me. I'm impressed. Sounds perfect. Love it with beschamel sauce,although I don't make it that way. I'm too laxy! We're having what my family calls Burnsville Hotdogs, hotdogs the way I got them at Lil Smokey's in Burnsville NC when I did summer stick(Google Lil Smoky's) Its a hot dog with mustard,onions,chili, and a generous topping of cole slaw on top. Amazing. Also making homestyle home fries to go with them. I can't wait for it to cool off enough to make lasagna! And if you don't mind, how did you make ricotta? It's obscenely expensive here, and I love it in a wide variety of things. I've also put hot dogs on my grocery list; I've got some hot dog chili my brother-in-law made. Tonight was "what do I have in the cupboard" night since I forgot to take anything out of the freezer. Gnocchi and baby purple potatoes with bacon in garlic scape pesto (bought in Maine from someone's porch). Yum! I used the recipe from Epicurious but I had to double it to make the amount of lasagna I made. I will copy and paste it. Line a large sieve with a layer of heavy-duty (fine-mesh) cheesecloth and place it over a large bowl.Slowly bring milk, cream, and salt to a rolling boil in a 6-quart heavy pot over moderate heat, stirring occasionally to prevent scorching. Add lemon juice, then reduce heat to low and simmer, stirring constantly, until the mixture curdles, about 2 minutes.Pour the mixture into the lined sieve and let it drain 1 hour. After discarding the liquid, chill the ricotta, covered; it will keep in the refrigerator 2 days. We went back in time tonight,one of my mom's depression era dishes:Hot dog casserole. It's chunked up hot dogs, potatoes and bell peppers:Cover all the pieces with two big cans of tomato sauce in a big caserole dish,add salt pepper, granulated garlic and parsley and cover with foil and bake at 350 for about 45 minutes or until potatoes are tender. That recipe is about 90 years old, and it's still a rustic treat! !